Cross of the Dutchman is an isometric adventurer that features a story based off of the real life figure of Pier Gerlofs Donia, a Dutch historical hero. The game is played in an isometric view where you'll be running around completing tasks as you explore the world and help save the people who you love. Cross of the Dutchman is a pretty simple game mechanically. Combat only has 2 buttons. A basic swing, and a special attack that takes stamina to use. Upgrading is just as simple, with only health or stamina to increase, and you'll also be given the opportunity to purchase new special attacks as well. The basic swing is faster but weaker, but the special attack not only is stronger, but can send multiple enemies around you flying into the air, which is pretty satisfying. Out side of combat the game is pretty linear in it's structure. Though the world may look expansive on first impressions, many areas are gated off until the game want you to reach said area. There are also stealth segments sprinkled in between to add some variety. 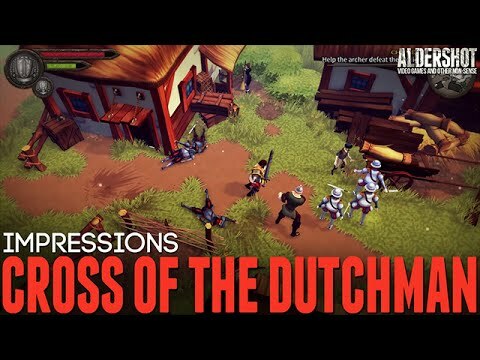 Cross of the Dutchman is a game that looks promising judging from trailers and screenshots, but after finishing the game in about three hours, the game shows a lot of flaws. As mentioned above the combat is very simple. This would be fine, except for the fact that it also feels sluggish, and it's the main activity besides running around. Since that's the case, it needed to be polished, it needed depth, but has none of the two. At no time did I ever switch to another special attack, or switch from sword to fist. Once I attained the sword and a special attack I liked it was all I used for the entire game. The adventuring in Cross of the Dutchman is also lacking. It being linear isn't an issue to me, but it demanding that I retread the same grounds three, four, or even five times over is ridiculous. There is a lot of running around in this game, A LOT of it. The game tries to break the monotony of either fighting or running with some stealth segments, but unfortunately the stealth is probably the poorest aspect of the game. It makes no sense why I can take on tens of soldiers at once one minute, then the next, I'm sneaking around just a couple of soldiers armed with lanterns! It makes no sense in the context of the mechanics, or the story, and is an obvious attempt at breaking up the flow in the game (which admittedly, does desperately need). The game's also short, clocking in at three hours on my first play through, with a story that disappointed me. It's not that the story or characters are necessarily bad, it just wasn't memorable for me. Maybe because I'm Canadian and not Dutch, so I don't feel that historical connection, but there were no part of the game where I felt any emotions, or care for the characters.... except at the end. With out spoilers, the ending of the game was abrupt and felt cut off. The game's narrative finally reaches a point where something interesting happens. Where emotions and character development finally start to take place, then ROLL THE CREDITS! WUT?! Again, I don't want to spoil anything, but the game's ending feels more like the story only just started. So I've mentioned a ton of things I took issues with, is there anything redeeming about Cross of the Dutchman? Though I've mentioned that I didn't like the combat much, the sense of impact when you hit an enemy, or especially when you use a special attack is really satisfying. Seeing a half dozen men go flying in the air, with some pretty good rag dolling and physics attached is actually pretty fun to see. The game also features some pretty good visual and audio design as well. The cut scenes are done in a still illustration format, but the illustrations are quite nice with a digital comic book look to them. The in game graphics, though low-poly, is quite charming, with colorful environments and characters, some nice particle and lighting effects, complimented with some pretty decent music. The game was also stable and optimized well for me. It never crashed nor did I encounter any major bugs, with it running at over 60 FPS the entire time. Overall Cross of the Dutchman was a disappointment to me, as I am a fan of Triangle Studio's other game "It came from space, and ate our brains". From the screenshots, trailers, and based off of their previous work, I had high hopes for this game. Ultimately it lacks variety, depth, and it's further mired by an abrupt ending to it's story.